Well geez, isn't this embarrassing? It's been a few days short of a whole year since I've put up some more of my painting shenanigans, and as you would correctly assume, alot has happened since. Just to wet your appetite for pretty, here's my latest addition to my Carcharodon WIP army. 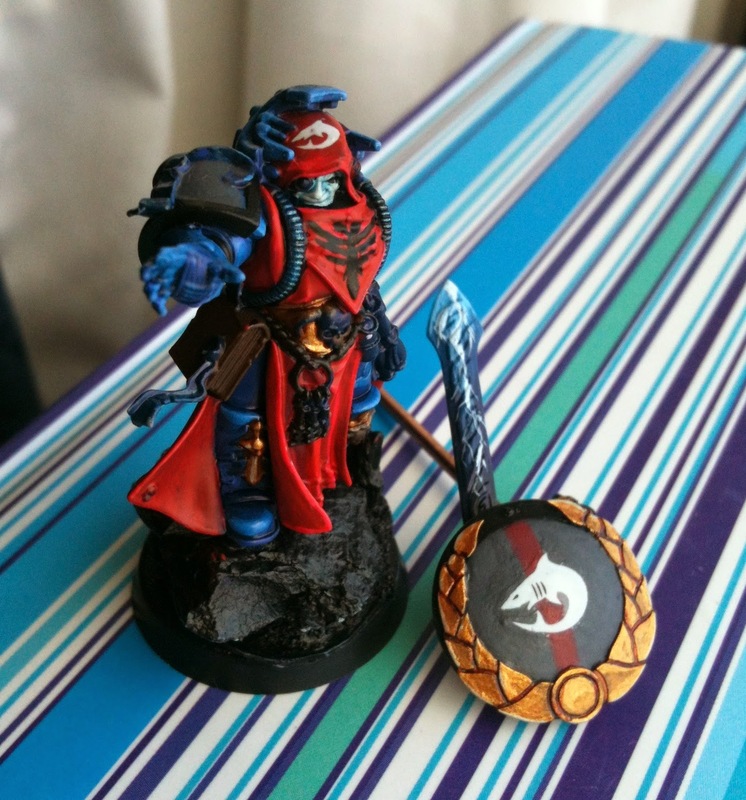 Converted from a Dark Angel Librarian, and carrying the venerable Shield Eternal, this albino void hunter will be leading my pack of bloodcrazed psychopaths one day.... But not today (sorry mate). Let's cut right to the chase! 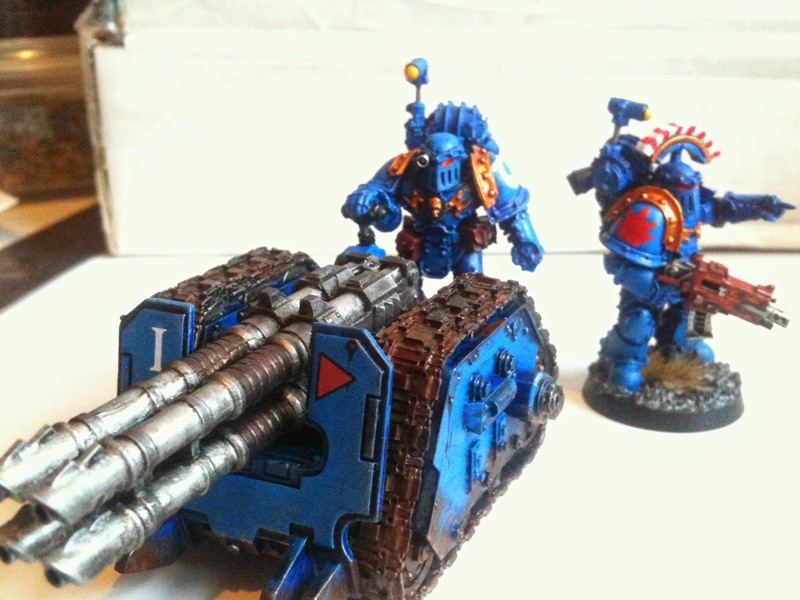 40k is getting the business round these here parts, with my local gamers and I gearing up and sanctifying our war-gear in preparation for what can only be described as a headlong charge into 7th Edition Warhammer 40,000. So what does this entail? And more relevantly, what does it mean for this blog? WELL! I'm glad you asked as otherwise I'd have nothing to talk about. A prominent member of my local gaming group has taken it upon himself to muster a whole army of the newly released Harlequin forces from Games Workshop. Through discussion this has mutated into a desire to ally up with my own steadily expanding Eldar army for a large balls to the wall battle against my brother's steel and ceramite wall of a Space Marine army. I will feature some of the units I have personally painted for Paul's army in just a moment, but the general idea is, BIG battle, MANY points, MUCH carnage. Coming to a tabletop near me in about a month or two. This fellow was a joy to paint, being a nifty Forgeworld specimen. I used a top-down approach to highlighting the armour, light to dark. I still think it needs some work to bring out the glyph details more, but for now he's rough and ready for battle. This was another Forgeworld item, and a very nice one at that. Fiddly as all hell to put together but its really impressive once it's done. The marines there have a similar highlighting effect to Mr Sevrin Loth, rather simple schemes as denotes their artillery crewman status. One thing I really enjoy about Forgeworld's 30k range aesthetic is that the models seem to exude a strange sense of realism that lets you get away with very elegant but ultimately simple painting schemes. 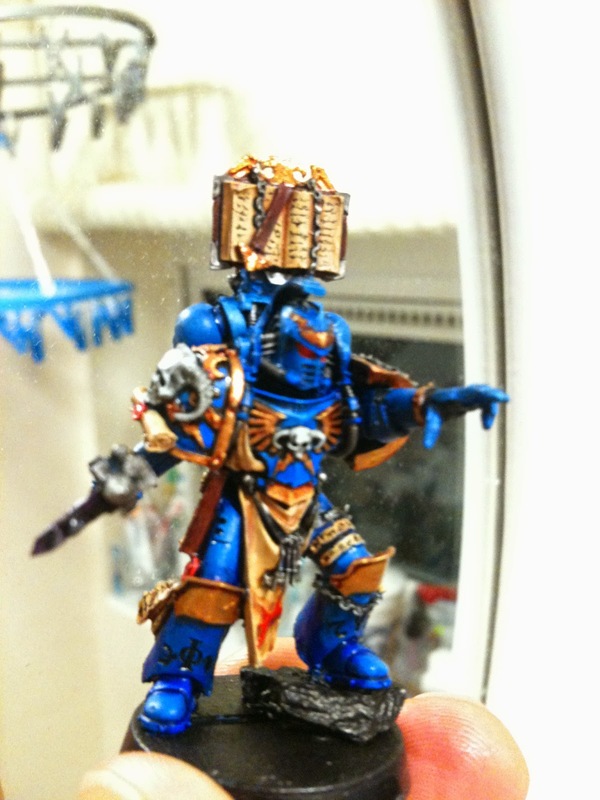 Plastic Ultramarines take a bit of legwork to avoid looking too cartooney in my experience. Right, well, with my sworn enemy shown off a little, it's time to get to what I've been working on at full steam for the last couple of months. My eclectic and mad-cap Eldar army has been a staple of my friendly matchups over the last several years, but they've never really 'worked' for me. And by that I mean I was confused about what I wanted them to be, or look like. 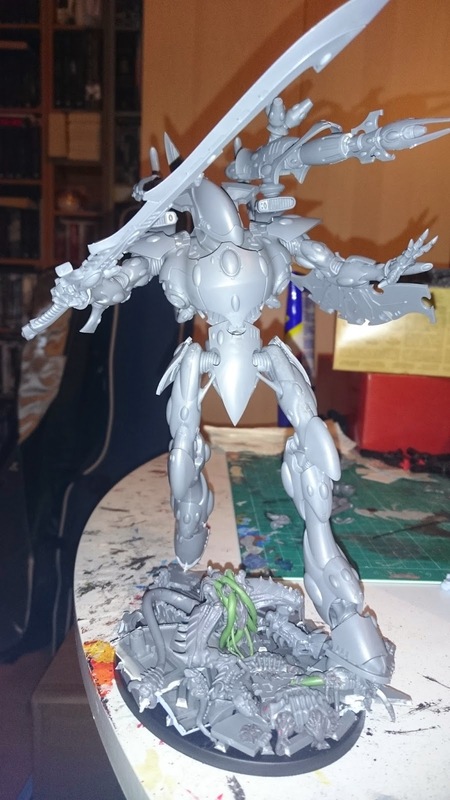 So after a mega eBay purging of the unloved and unwanted, I was to set my sights on a Wraith Construct themed Eldar army with a penchant for Banshees (I'm a sucker for a strong, independent woman who could kick my arse in a fight), and a mean streak that sees them ally with their darker brethren on mutually beneficial raids. 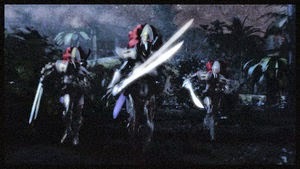 A wall of wraithbone featuring 2 of my favourite Eldar units of old; the Wraithlord and Wraithguard. These guys have forever been inaccessible to juvenile me, with my limited monetary funds. I call it a titan, because that's what it essentially is. Don't let GW fool you into thinking they haven't put titans into regular 40k now, it's done. Imperial Knights are everywhere! This big guy is the star of the show at the moment. As I liked the shield and Suncannon loadout the most, I had to find a way of making use of those parts as well as keeping the sword. Turns out the sword upgrade mechanically does very little for the guy, may as well use his bare hands to squish things. So why not assume the sword IS it's regular attack method? It's purely for decoration in this way, but I'll be damned if it doesn't look good! The sun cannon would have extended about 3 inches past his sword's hilt if I'd stuck to the instructions and strapped it to his sword arm, (Pfah! Who ever does that anymore!? ), so I custom built it (stuck it with glue) onto the shoulder turret mount instead. What's more, as you can see in the second photo, the suncannon's targeter now sits flush with his shield arm, so that it captures a 'Predator shoulder cannon' targeting impression. Finally, the base. That is indeed a discombobulated (that's a real word? Spell check, you teach me new things every day) Hive Tyrant. 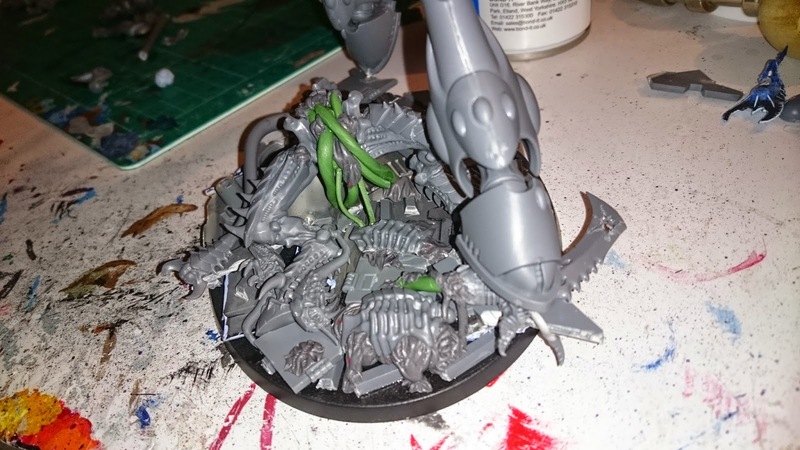 Rather than go insane and sacrifice a perfectly good Alien Overlord to the role of mere basing-fodder, this is simply the spare parts my Flying Hive Tyrant "Flappy" (Christened name) didn't need, namely the grounded legs and alternate head. So SQUISH goes the Hivey, having been blasted to ribbons by a triple shot plasma cannon, the Knight is contemptuously stamping on it's head like a ripe melon as it forges onwards. A little greenstuff work for the gribbly innards and a bunch of stunned/synapse shocked rippers scattered here and there and we have ourselves a base worthy of an Eldar Titan. 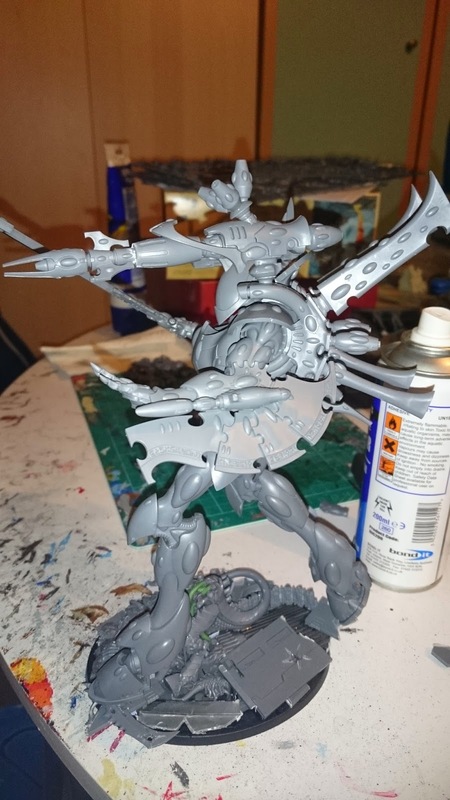 I am entertaining ideas about mounting a couple smaller Eldar infantry scurrying over the remains, purely to accentuate the scale of this thing. And it is HUGE... You'll see soon it if it happens. Oh, and I've been making terrain! This was a vibrant green rainforest until Sevrin had a picnic. I'll give you a closer look at that stuff next time. It's exciting times though, as I've discovered the wonders of laser-cut MDF, used for the alien forest base you see here. 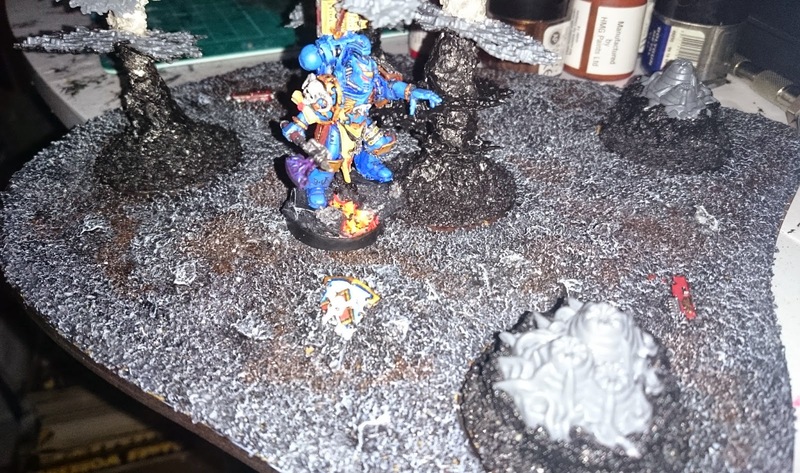 Next time: more ghost warriors, some Aliens get their pink on, and Terrain Terrain Terrain! This prominent member wouldn't be Den would it? He was bugging me for colour scheme suggestions for Harlies the other day! Good luck with all those tiny diamond patterns though!